After completing some daily quests this morning and turning in Netherwing Eggs, I reached friendly status with the Netherwing earlier today. That opened up even more quests and I'm now over 2/3rds of the way towards honored. After finishing all those Netherwing quests, I did my daily cooking quest, some Skettis quests and had one more daily to do so I chose one of the 4 in Blade's Edge. I think this is the first time I've done all 10 daily quests. I currently stand at over 350g, and if I hadn't loaned 150g to Dylana for her epic flight form, I'd be able to pay back Vetarra in just one day. With all my questing done, there was one thing left to do for Winter's Veil. After hearing that all the recipes didn't go out as planned, the Smokeywood Pasture workers offered up their patterns for sale directly. Since Red Winter Clothes were for Alliance and Green Winter Clothes were for Horde, they were each for sale in Ironforge and Orgrimmar, respectively. So I set off for Orgrimmar to retrieve a green winter pattern of my own. I ran past a few guards at the door, blinked away from the ones following me and popped invisibility. I was able to find the Winter Veil tree while invisible, but didn't see the Smokeywood Pasture vendors. After looking around some more, I found them, but at that point had 5-8 guards on me. I tried to buy from the vendor, but an unfriendly Tauren named Loader decided to attack me even though I was dressed in my winter clothes and not displaying any hostility, and he killed me. I ran back, ressurected at the vendor, bought the pattern, and ported back to Shattrath. So I can now craft Green Winter Clothes as Alliance. I am quite happy. What a great day it's been! When I made it back to my Scryer bank mailbox, the lovely Vetarra had sent me 500g. With that, I had enough to travel to Wildhammer Stronghold and train in the artisan skill of riding. I then booked it over to Blackwind Landing and purchased a very beautiful Silver Riding Nether Ray. It is downright ridiculous how fast this mount moves. I was able to fly from Skettis to Coilfang Reservoir faster than I could have ridden a gryphon. I also proceeded to Netherwing Ledge where I had a bunch of quests to do. I quickly found a Netherwing Egg and turned it in. Vetarra also showed me where I could find more eggs and I found one more. I then killed some couriers flying the crystals back and forth and also poisoned some of the grunts mining the crystals. Aracely then asked if I wanted to run a heroic, and though I don't need badges, I'm up for a heroic usually. I wanted to go to either Steamvaults, Shattered Halls or Arcatraz as I still had all three Trial of the Naaru quests. We chose Steamvaults which was doubly good for me since I need reputation there still. We struggled on one pull for some reason, but other than that had a great run. I made it out with 2,200 rep after turning in 5 coilfang armaments, but the best part of the run was...drumroll please...Formula: Enchant Bracers - Fortitude! Woohoo! Just three to go - Savagery from Shattered Halls, 2H Major Agility from Arcatraz and Boots - Dexterity from Auchindon. And yes...it's quite hard to spend all that gold in one fell swoop. 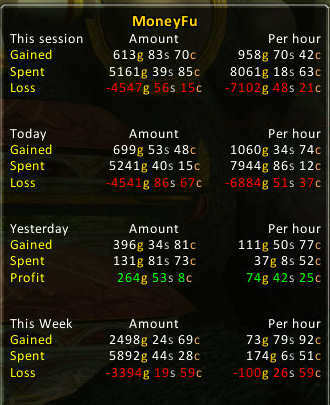 ((Looking at that last screenshot there, it says I earned 73g per hour over the last week - not too shabby. However, a lot of that was earned from a banking alt, which, now that I think about it isn't a big deal since I earned all those runecloth stacks and winterfall firewater on Tiddlywinks. The only thing that really skews that number is the 500g lump sum influx I received from Vetarra. But still, I made upwards of 60g an hour over the last week. And yes, I was saving money, but I wasn't out grinding items that would sell high. I was out grinding reputation and doing dailies. That's about it. Yesterday, I managed to sell over 20 stacks of Runecloth that I had picked up while grinding Timbermaw and Cenarion Circle reputation. I also sold my Stockade Pauldrons cheaply (50g) and I'm now within 500g of my epic flying mount. So when I saw the guild banker online, I asked her what the bank policy was on loans. Unfortunately, our guild bank does not make loans, as all gold deposited is currently earmarked for new tabs. With my good friend Dylana currently working on saving for his epic flight form (she will probably be learning it this weekend), she was unavailable to lend me the money. However, the queen herself, Eirama stepped in and offered to foot the bill. I should have mail waiting in my mailbox when I return to the Scryer bank and then I will be off to get trained. However, if she is not available tonight, Vetarra graciously offered to also loan me 500g, so I might take her up on the offer tonight. I also have some other auctions up currently, so I'm hoping I can pay either Eirama or Vetarra back by the end of this long weekend, making it a very short loan. Thankfully I am part of such a loving, helpful, and friendly guild where everyone goes out of their way to help others and, while relaxed, we are making steady advancements in raid progression. I don't know why people are selling them so cheap, but I got a Jingling Bell for my very own reindeer for just 3g and a Snowman Kit for only 2g! I've stocked up on the snowballs and plan on having a reindeer, snowman, or green helper out whenever I can! While farming both Timbermaw and Cenarion Circle rep these past few days, I've come across my fair share of cards, world drops, and other random greens. But more than anything, I've come across runecloth, and lots of it. So yesterday I put up 25 stacks on the auction house, severely undercutting everyone and, lo and behold, when I checked my mailbox later, every stack sold. Could I have made a little more money by listing them at a higher rate? Probably. I probably could have even made more Red Winter Clothes from them as I've sold about 10 sets for about 8g each over the past 10 days. But I wanted to make some quick money and that was the easiest way. Each stack sold for about 2.5g and I netted a cool 63g or so. Not too bad when all I've had to do is stop by a town every so often and mail the runecloth to a friendly Dranei Shaman who puts them on auction for me. I also have listed a stack of Greater Eternal Essences and Illusion Dust on the auction house, but haven't checked to see if it sold yet. Those stacks come courtesy the greens I am able to disenchant. I'm hoping they sell since I can make much more money disenchanting those items than selling them to the local vendors. On a completely unrelated note, I recently lamented the fact that I didn't get a reindeer this year, but instead a Red Helper (I also picked up a Green Helper at the auction house). Well, just like the Green Helper I picked up at the auction house, I hear that you can find a Jingling Bell at the auction house as well as a Snowman Kit! I shall have to check tonight to see if I can pick those up at a reasonable price. I found my green helper for only 15g and would be willing to pay up to 25g each for those other beautiful pets (especially the reindeer). I am also getting quite near my 5,200g needed for my epic flying mount. Even though I have bought a few things for myself recently, I also have been selling quite a few nice items at auction. But if I can't make it to 5,200 by Saturday or Sunday, I will be hitting up some guildmates for a loan - after all, I hear those Netherwing daily quests have nice monetary rewards. While these ramblings focus on my life as a gnome mage, stop on by Resto4Life.com for some good discourse on my druid friends. A clean, easy to read layout and insightful articles make this journal a must-visit! It's a shame that Winter's Veil has to come to an end, but I stocked up on snowballs in anticipation of receiving a reindeer, but instead received a Red Helper Box. It's a cute little gnome dressed in a Holiday Outfit and he matches me perfectly - except I don't have a red hat. So I went out and bought a Green Helper Box and today my Green Helper has been following me around. I also received a Mechanical Greench who will fight for me when summoned. On top of all of that, Greatfather Winter also had a Clockwork Rocket Bot for me (not listed on WowHead yet). Man, what a crazy day while grinding. First, this morning I find the Two of Elementals. Then, while in Stratholme, I found some Stockade Pauldrons. And now, while farming Timbermaw rep, I find the Three of Elementals and the Viking Warhammer which Stogen can use in our guild. A long, interesting day.